It’s been a while since we last published an edition, and it’s been just as long that we’ve been meaning to reprint that unexpectedly popular little gem of an issue mono.kultur #15 with Taryn Simon, which might still qualify as the issue to sell out the fastest so far. 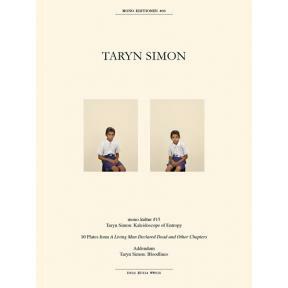 So when the occasion of Taryn Simon exhibiting her new series ‘A Living Man Declared Dead and Other Chapters’ in Berlin forced us into a now or never-moment, we thought why not combine the two, and instead of simply reprinting the issue, why not extend it to the now with new material? Which is exactly what we did. So here it comes: mono.editionen #03 with Taryn Simon. A pretty little package in those lovely photographers’ glassine envelopes, containing not only a reprint of our original issue #15 from 2008, which we might have already mentioned we feel to be a little jewel in magazine design; but also an interview addendum with Simon talking about her latest work ‘A Living Man Declared Dead and Other Chapters’, as well as ten plates thereof, printed as a set of separate cards. As you might be able to tell, we’re pretty pleased with ourselves that what started as a snappy idea on the spur of a moment turned out so awfully nice.